Over time rust, scale, sludge and deposits can build up on the inside of your engine’s cooling system meaning it doesn’t work efficiently and could lead to blocked channels. In extreme situations your vehicle can overheat or freeze in winter with consequences that are fatal for your engine. 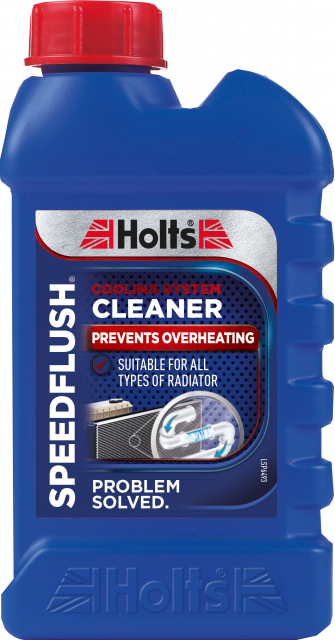 Holts Speedflush is a cooling system cleaner that clears the radiator and cooling system quickly. Flushing out harmful scale and deposits will prevent overheating and extend the life of your vehicle. It can be used on any engine to clear out scale and debris, ready for filling with antifreeze/coolant. Clean your engine’s radiator and cooling system today with Holts Speedflush.